Out of nowhere, Marvel dropped the first trailer for Captain America: Civil War late last night, and it didn’t disappoint. It’s pretty exposition heavy (interspersed with some excellent action), giving viewers a pretty clear idea of what the film is about. That is: the division of our favorite superheroes. But, more than that, it’s about how these characters grow through adversity. We’ve seen the Avengers battle their own inner demons, and tackle some pretty formidable foes. But all of that pales in comparison to the test they’ll face in Civil War. These characters have built a pretty strong bond over Phase 1 and Phase 2, but all of that will come crashing down once the government gets involved. While the trailer is pretty straightforward, we felt a breakdown was necessary to further explain what’s happening, and to point out anything you may have missed. 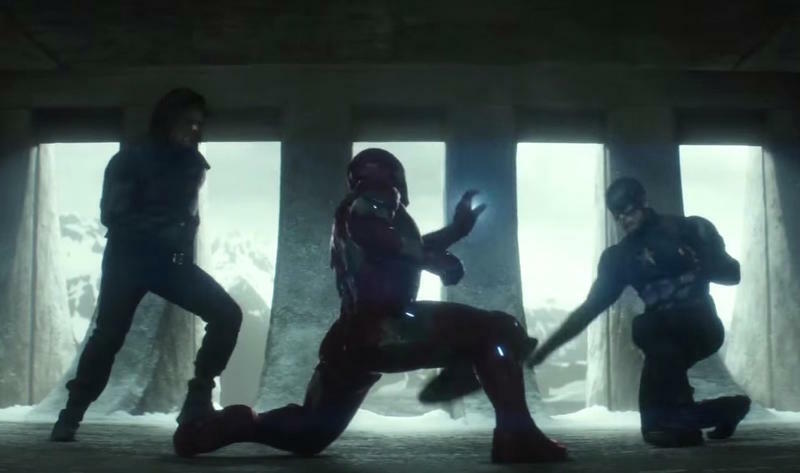 And, come on, that scene with Bucky and Captain America pummeling Iron Man is worth seeing again and again. It’s about time Cap and Iron Man fought after all the tension that was built in Age of Ultron. If you stayed for the end credits scene in Ant-Man, you’ll recognize what’s happening in the trailer’s opening shot. Cap and Falcon have finally tracked down Bucky, who has his mechanized arm in some kind of vice. They’re interrogating “Buck,” who appears to finally remember his life before he became the Winter Soldier. It’s a pretty touching moment, and the relationship between Cap and Bucky looks like it’ll anchor the entire film. On that note, you get the sense over the duration of the trailer that Cap will do anything for Bucky because of their history together. These two formed a powerful bond in the first Captain America movie—even before Steve Rogers became superhuman. Because of that, Cap demonstrates a fierce loyalty toward Bucky, even if that means turning his back on his other friends. I’m curious to see how far Cap is willing to go to protect Bucky. Is he willing to give his life? Comic fans will know what I’m getting at. Their relationship could prove crucial to the remainder of Phase 3. As Cap informs Bucky that he’s a wanted man, Bucky responds by saying he’s no longer a Hydra assassin. But try telling that to the police, who storm on their location before the group (Cap, Bucky and Falcon) eventually escape. The word Polizei is written across the uniforms of the team trying to capture Bucky, which is the German word for police. Whether their location in Europe has any significance I do not know. Worth noting that at the 0:27 mark, it sure looks like whatever brigade is after Bucky is being led by Crossbones, who makes the very briefest of appearances in the background. You can see him at the tail end of the formation, as indicated by the X across his chest. The next scene kicks in, with General Thaddeus “Thunderbolt” Ross (William Hurt) explaining to Captain America that some people see him as a vigilante. A thick document with the words “Sokovia Accords” written on it, which is a direct reference to the incident that occurred in Age of Ultron. Sokovia was where Hydra established an underground compound, and also where Wanda and Pietro Maximoff are from. Cap is obviously getting some kind of ultimatum from General Ross, and he does not look pleased. It sounds like what transpired in Age of Ultron, and to an extent in The Winter Soldier, is being used as the reason for the Sokovia Accords. Bucky is clearly being used as some kind of scapegoat, though it sounds like Cap is the only one willing to forgive his past and see him for who he really is. Black Widow tries to empathize with Cap’s loyalty to Bucky, but asks him to just let it go. That’s when we get our first shot of Iron Man, who is wearing that Bleeding Edge armor we’ve been hearing so much about. This armor, for those who don’t know, made Iron Man one of the strongest superheroes in the comics, and allowed him to stand up against Thor and even Hulk. The really cool part, however, is that the entire armor is kept inside Tony Stark’s body, and activates once mentally commanded. The next shot shows some authority types take away Captain America’s shield as he and Falcon look on. “If we cannot except limitations, we’re no better than the bad guys,” Stark says. It’s funny to me how Tony would be in favor of government orders after being so anti-establishment in the earlier movies. He’s typically a confident solo act, but it’s clear that he feels deep remorse for his Ultron protocol, and wants to ensure something like that doesn’t happen again. If that means working under the government’s watchful eye, then so be it. Of course, Cap is opposed to this idea, which forms the crux of the movie’s plot. After the plot is laid out, the trailer starts introducing some really cool action shots. Falcon performs some impressive acrobatics, while Cap brawls with some government agents. We then see Cap and his group (Hawkeye, Falcon, Bucky and Scarlet Witch) confront Iron Man and War Machine at an airport. This is also where we’re finally introduced to Black Panther, who is literally introduced among a halo of light. We’ve been waiting to see Black Panther in action for nearly two years now, so it’s great to finally see him appear onscreen. Since Black Panther is getting his own standalone movie, I’m not really sure how much backstory we’re going to get in Civil War. Will we get a ton of character development? Or will he simply be involved because he’s pissed about the Avengers coming to his home country of Wakanda in Age of Ultron? One popular rumor claims Black Panther wants Bucky dead, due to the fact that Bucky killed Black Panther’s father while he was still a brainwashed assassin. That’s reason enough to want vengeance, but obviously Captain America has something to say about that. Right around the 1:55 mark, we see Cap chase Black Panther through a tunnel, and it’s probably the coolest moment in the entire trailer; the implied speed is great. The next shot demonstrates the immense strength Cap possesses, as he holds down a helicopter from taking off. Who is in the helicopter? That much isn’t clear, though it’s riddled with bullet holes. After a few more explosions, we see Bucky wailing on Iron Man, and try to damage his arc reactor. Cap’s voiceover is supplemented with a shot of Iron Man holding onto an unconscious (dead?) War Machine, whose armor is severely damaged (note the arc reactor is ripped out of his suit). In the background we can see smoke billowing from the German airport the Avengers were just fighting at. Stark seems genuinely hurt by Cap’s words—you can see it in his expression and hear it in the ton of his voice. “So was I,” Stark replies. The past tense is obviously the kicker there, as Cap and Stark have obviously had a major falling out. The last shot is what people will be talking about. At some sort of mountain base, Cap and his pal Bucky team up on Iron Man, who appears overwhelmed by their skill and power. But before we see the conclusion of the fight, the trailer cuts away to reveal the movie’s title card. The trailer divulges a lot of information, but plenty of the mystery is left unsolved. Although we get our first look at Black Panther, it looks like Marvel wants to save the appearance of Spider-Man until the movie’s release. We also don’t get to see Baron Zemo, who is supposedly the big bad of Civil War. Captain America: Civil War is scheduled for a May 6, 2016 release.